Hello crafty peeps!! Happy Pre-Thanksgiving to all ( United States). Before the hustle and bustle of traveling, cooking and eating begins, I wanted to get my submission in for the latest Lawnscaping Challenge!! We get to play with tags this go round. Now, I will freely admit - I don't create tags as much as I'd like to - it seems my focus is constantly cards - but it feels good every now and then to break away from cards, and do something different! For my tag - I am trying to get inspired with making Christmas cards, winter-themed cards because it is getting that time of year! I also thought - I was also inspired by those that have a birthday this time of year (myself included - Dec 3rd)!! 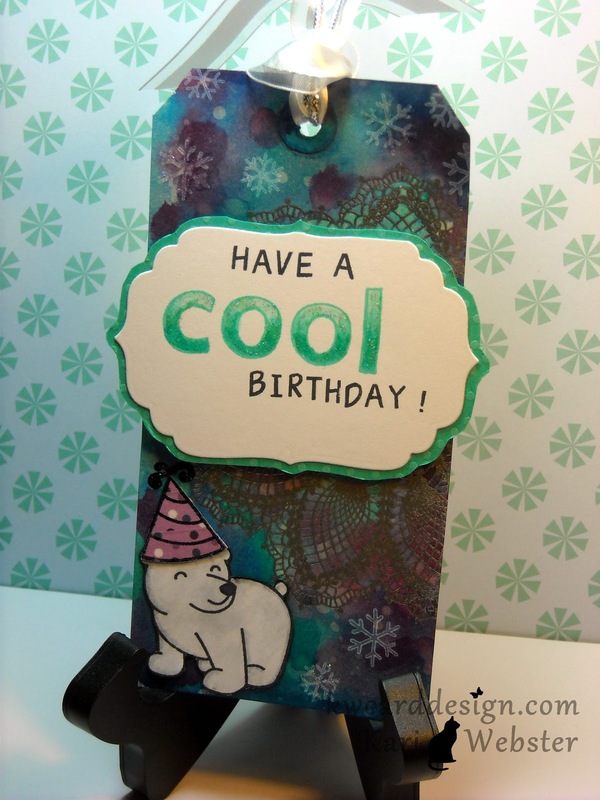 - so I thought - how 'bout making a winter-themed birthday tag!! So - I actually started this tag before I knew what this challenge was all about. 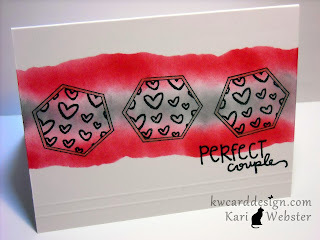 I received in my latest Simon Says Stamp order some of the new Seasonal Distress Stains! One word - L.O.V.E.!! I am slowly getting into using these different products that are out of my element, and I am having fun inking up my fingers more than normal!! hehe! 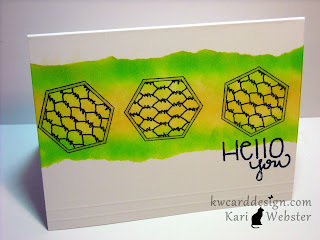 I first stamped and heat-embossed with silver embossing powder on my manila tag, my Hello, Doily stamp from SU! - such a beautiful image! Then, I used my Ranger Craft Sheet to start the inking process. I took Peacock Feathers ( my favorite! ), Salty Ocean, and Seedless Preserves Distress Stains and mixed all those colors together - this turned out so much better than I thought it would. My favorite technique is the emboss resist technique - so much fun and such great results. I stamped out my polar bear from Critters in the Snow in Memento Tuxedo Black Ink, and then some light Copic coloring to give my bear "some" color. 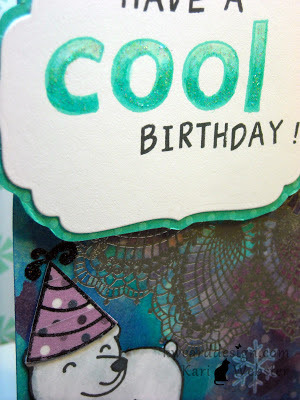 I then stamped out a party hat from Hats off to you, and used some fun washi tape on a scrap piece of card stock and then stamped the same party hat image with Black Staz On Ink since I was stamping on a slick surface like the washi tape. Then I cut out my hat and paper pieced it onto my polar bear. I stamped out some snow flakes with Colorbox Frost Pigment Ink to give more dimension to my tag. I always enjoy participating in this challenges - they extend my creativity so much!! To my USA followers - Happy Thanksgiving!!! Make you travel safe and enjoy the time with family and friends!! 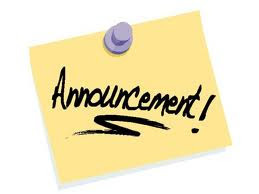 Please email me at kikiwebster30@gmail.com to claim your prize!! Thank you to all that left comments!! Till next year!! 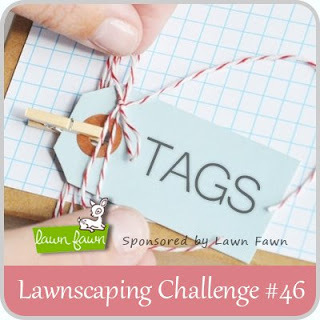 I'm so happy its time for another Lawnscaping Challenge. 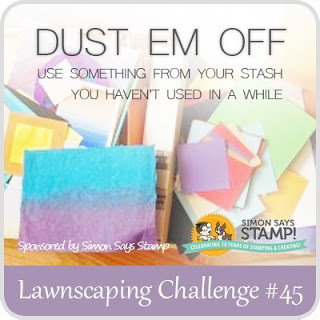 For this challenge, it is time to "dust 'em off" - use something in your stash you haven't used in a while. That wasn't a problem for me at all. Actually - there are several things in my craft room I haven't even used yet! Mainly - because they are products that I am not sure of myself with, but you can't get the best use with them if you don't use them. So - for my card - I used some of my mists and a mask that I hadn't used yet. I just love this pattern of this mask. I think overall - my panel came out pretty good. I love blues and purples. 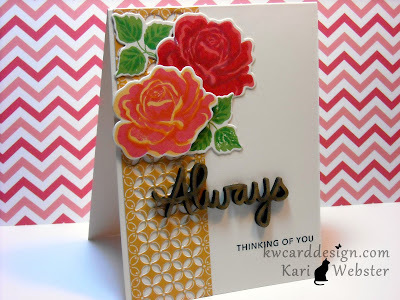 I used the set "Ornate Ornaments" from Lawn Fawn. I wanted to keep this card fairly simple in design, because I knew the misted panel would be "busy". I took the smallest "twinkle" image, and stamped several times in VersaMark Ink, and heat embossed it using silver embossing powder. I love watching silver embossing powder melt. Something about it is just so soothing. I also did the same with my sentiment "Be Merry" from LF set Pa-Rum-Pa-Pum-Pum. 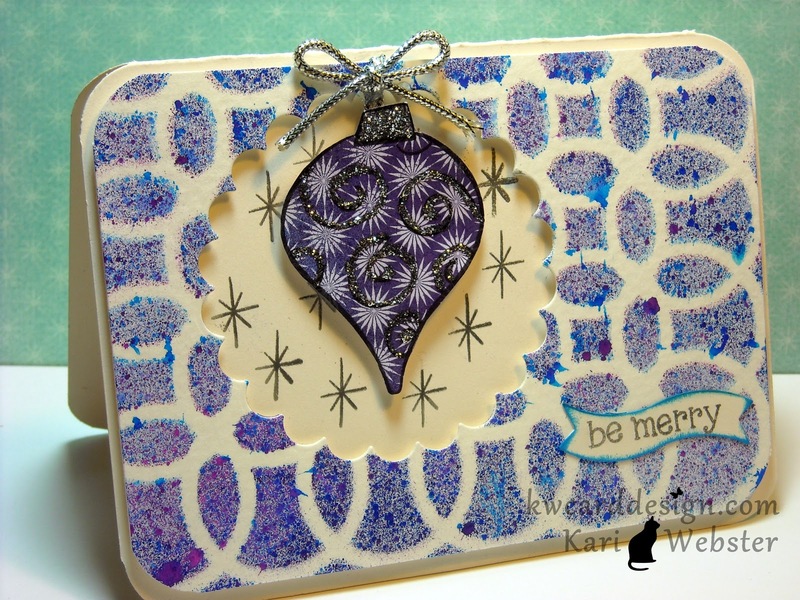 I die cut a scallop circle from my card panel, and I popped up both the ornament, and the misted panel off of my card base which is Vintage Creme card stock from PaperTrey Ink. I added silver Stickles to the ornament to tie in the silver cording at the top. This marks my first holiday greeting card this season!! 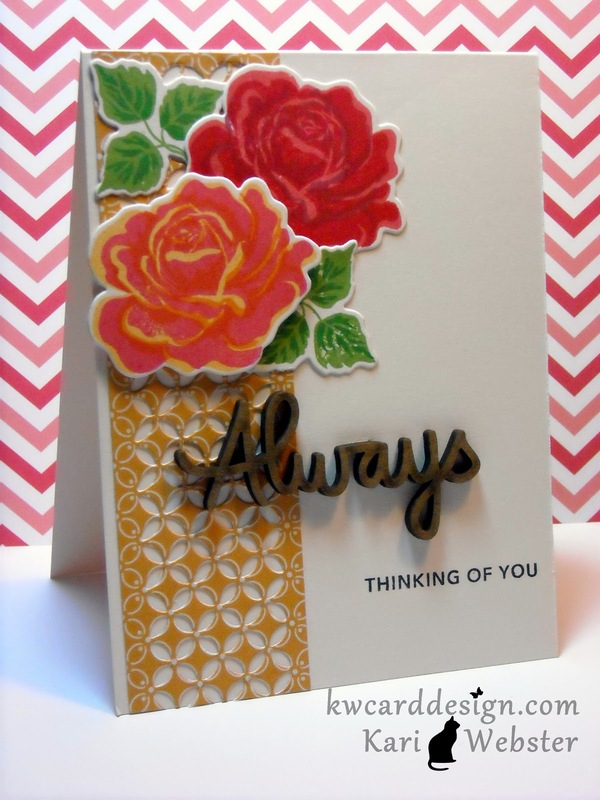 Hi everyone and welcome to Day 2 of Sweet Stamp Shop's Nov Release. Today, we are taking a sneak peak a overall wonderful set that can be used for all sorts of occasions!! This set is called "Simple Sentiments". You should have arrived by me from the lovely Emily. I wanted to showcase my cards in a simple, but affective way. You could whip up a set like this in no time. All I did for these is make an A2 size card from white card stock. Then I took some layering weight card stock, and made a torn edge, and using various ink colors, I used that torn edge as a mask. It really makes the card bases pop - and what is so great about this is that it gives it such dimension, but leaving the card a one layer card!. 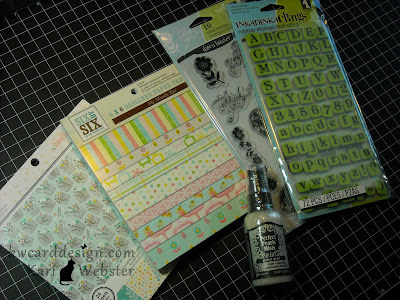 I stamped in the middle some of the images from Pattern Craze. I love all of these sentiments, and this is just a taste of what is in the set. I just love Nicole's hand writing on these! This is a MUST have set!! It is time for me to sent you on your way to the so oh awesome Laurel!! Be sure to leave comments along the way for a chance to win these wonderful sets being released this week!! See you soon! Happy Sat Everyone!! - Today I am getting retro with Sweet Stamp Shop. I recently received my order of the Hero Arts Neon Ink, and I wanted to play with those. So - I started out by stamping out onto white card stock and heat embossing SSS Against The Grain background, and I embossed it with black embossing powder. 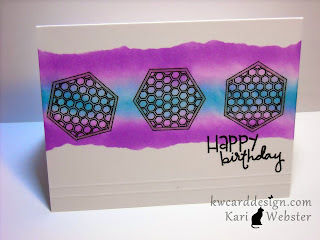 Then, I did the emboss resist technique - I added color with the neon inks to the background, and with various sizes of circles with circle punches. 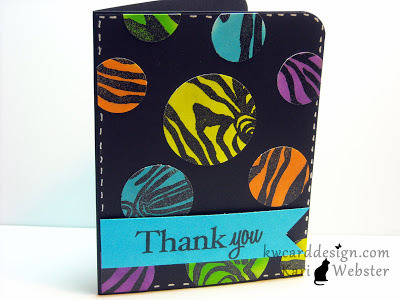 I added the circles randomly on my black card base, and then for my sentiment which is from Packaged Pretty, I strip of white card stock left over, and took the Neon Blue color, and using the ink pad directly onto that card stock, and made my strip blue - then stamped my Thank you sentiment. 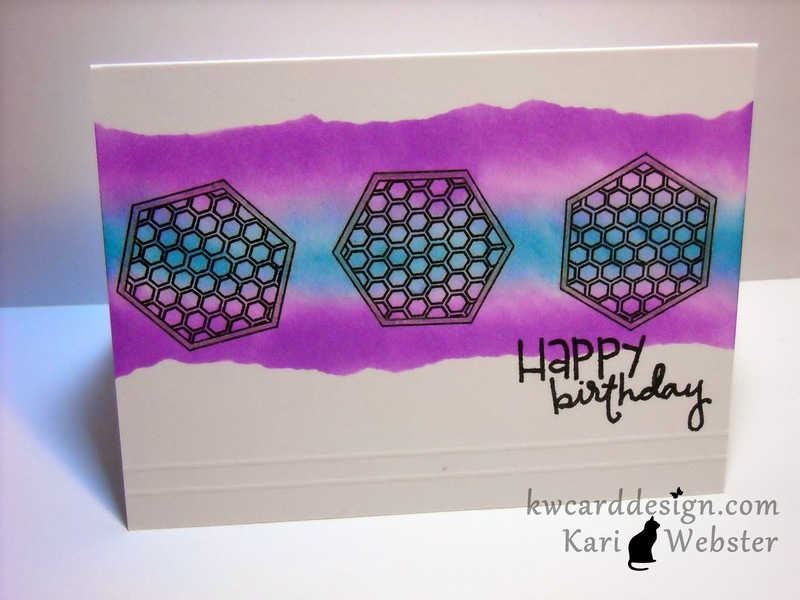 - for interest I added a banner shape to the sentiment strip, and then used dimensionals to pop it off my card.